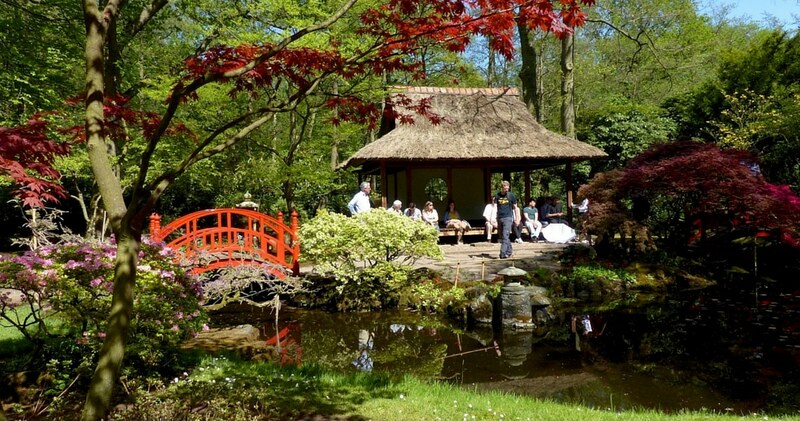 In the heart of one of the most impressive parks of The Hague lies a small gem, filled with dense moss, a relaxing pond, bright red bridges, sculptures, and lanterns. The bursting colors of maple trees, ginkgo biloba, rhododendrons, and azaleas illuminate this secret place. I almost missed it the first time I came to visit the Japanese garden in the Clingendael Park last autumn. Lost in the maze of huge trees and dark bushes, it took me a while to find it, as if I had to be worth it. 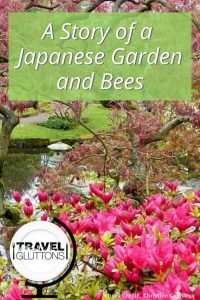 The Japanese garden opens its doors only twice a year, in autumn to admire the fall foliage and in the spring, to watch the cherry trees blossom and the colorful azaleas and rhododendrons come into full bloom. Created at the beginning of the 20th century by Baroness Marguerite Mary van Brienen, also know as Lady Daisy, it is a very unique place in the Netherlands. 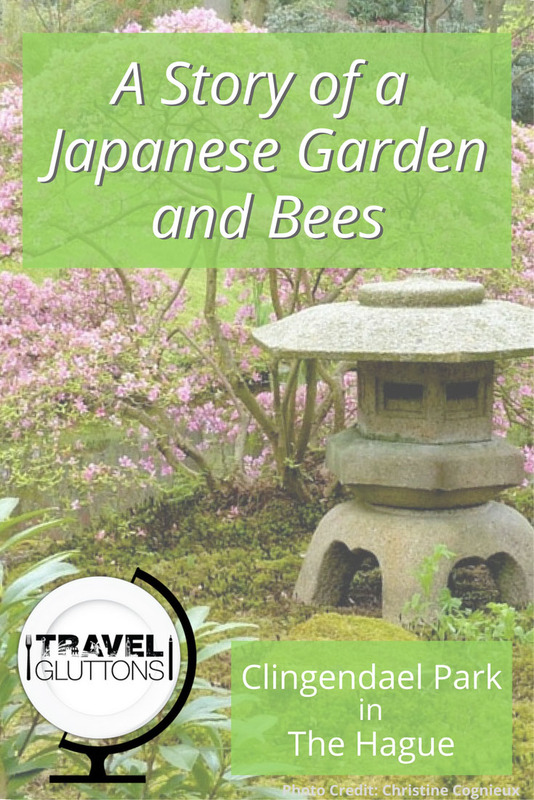 After traveling to Japan, she became fascinated by the Japanese gardens she visited and their unique aesthetic beauty. 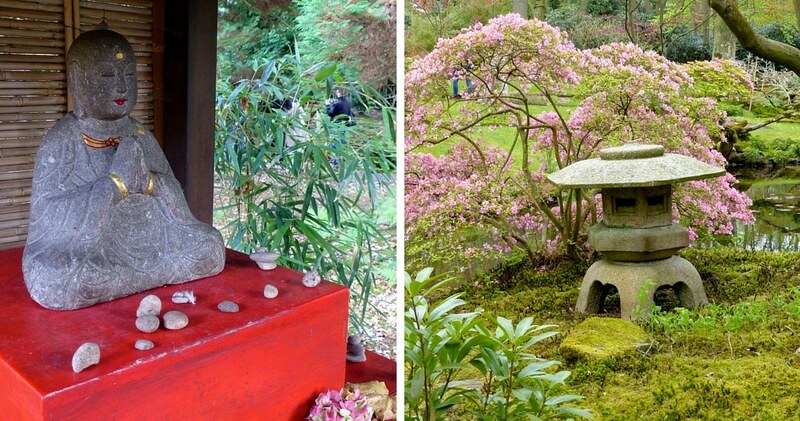 She decided to create her own interpretation of a Japanese style garden in her home city, The Hague. 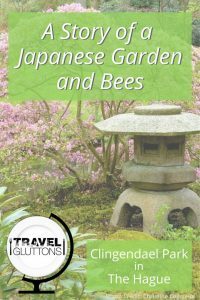 In order to do so, she brought back from her many trips to Japan, lanterns, sculptures, little red bridges, and even a pavilion. Wandering along its small pathways, amongst deep green moss, various plants, and beautiful trees, brings peace and a sense of fulfilment to the visitor. Everything you lay your eyes upon seem to have a meaning. The meandering brook, the thick layers of moss, the intricate tree trunks — all are so appealing. The stone lanterns are sculpted with a representation of Buddha, others with a deer, an animal considered sacred in Japan. The small turtle island and the crane-shaped stone setting are both symbols of long life. Look for the small statue of the Buddhist Saint Jizo in the back of the garden. He is the patron of children and travellers. You will also find him sheltered in a small shrine. Try to spot the two water basins, one with four Buddhas, the other in the shape of a lotus flower, a symbol of good fortune in Buddhism. Take a rest in the lovely pavilion. It is designed to be a place of contemplation for the visitors. Then cross over the serene pond using the red bridges as if you were crossing over from one world to the next, from the profane to the sacred, cleansing yourself to enter the pure world of nature. Yes, this is a place like no other, and one you should take great care of. Many visitors come to this magnificent but small place. It gets crowded very quickly so get there early or in the late afternoon, when the sun is playing in the maple tree leaves. 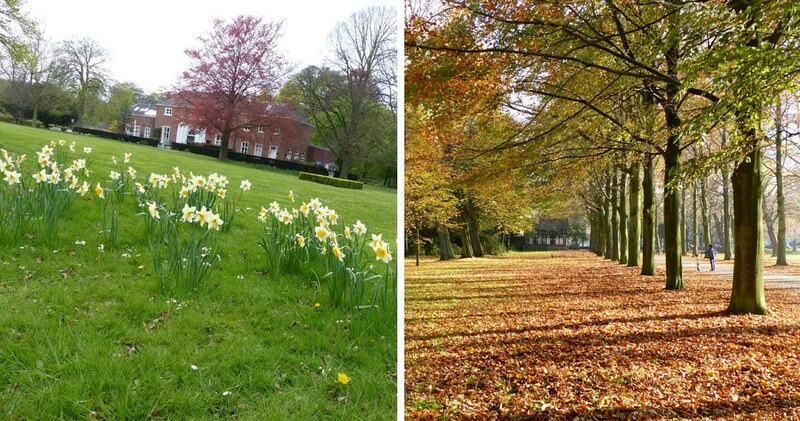 The Clingendael Park itself is not to be missed and full of history. The site where the Clingendael Estate sits served as farmland until 1591. Philips Doublet then purchased the property. His grandson dissolved the farm to build a house in baroque style, and it quickly became the center of culture and art. I loved to sit under the huge trees and watch the reflection of the elegant house on the water of the large pond in front of it. Over the next several hundred years, the property changed hands many times and the estate’s gardens expanded. Today, the house is owned by the municipality of The Hague and serves as the Dutch Institute of International Relations Clingendael. I also enjoyed the elegant Dutch garden. Created in 1915 by Duchess Marguerite van Brienen, it is based on the traditional British Dutch Garden. The design consists of a geometrical pattern of several different box hedges filled with flowers, complimented by shaped shrubbery, forming sophisticated symmetrical geometric patterns. Wandering around the alleys of the park and its luscious lawns, you might come accross a lady feeding the herons, adorable lambs playing in a field, a lively donkey, many geese guarding their territory, a lovely tea house, fun playgrounds, and even a beekeeper. The apiculturist has been making honey for 40 years, 30 years at this location. 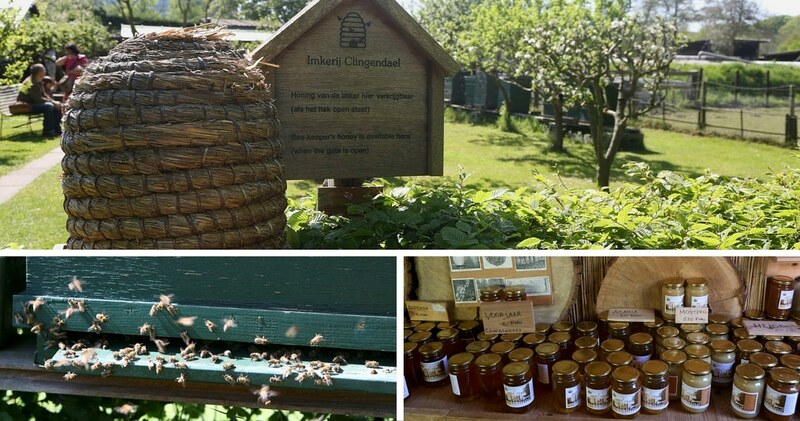 In his small shop, you can choose from 13 varieties of honey collected right in the park, in the woods, and in the duin around The Hague, as well as pollen and candles. I couldn’t resist buying some jars of this delicious and precious nectar. It’s a real treat to sit in the garden and watch the dancing bees returning home with the treasured pollen. Don’t leave the park without a visit! It is right near the south entrance, off the main alley. The Clingendael estate is freely accessible, easily reachable by car or bus, and open throughout the year. The Japanese Garden is only open for a short period in the Fall and in the Spring. 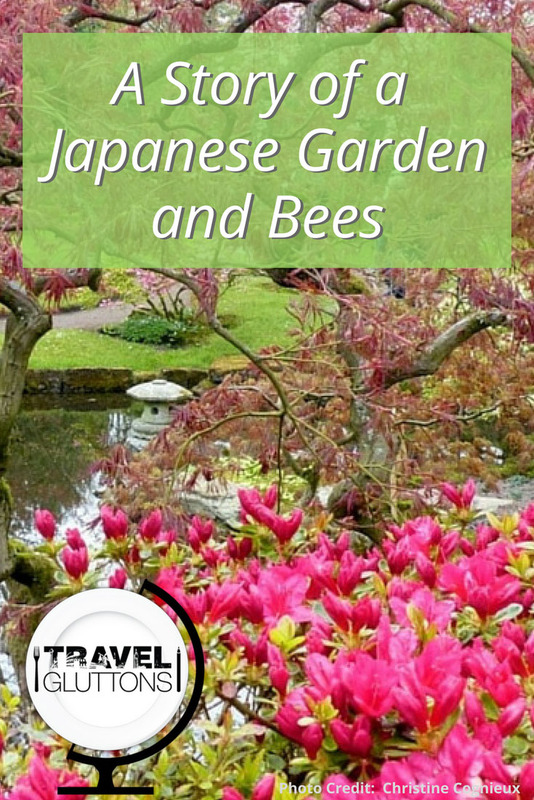 Check the Japanese Garden website for the exact dates and opening hours. 14 Responses to "A Story of a Japanese Garden and Bees"
Thank you Laura. It is really delicious and they have so many varieties that it is difficult to choose. So I left with several jars! The best part of it is that it is local and so good for you! What a wonderful find – we traveled through the Netherlands last year but didn’t think to stop in The Hague. Will definitely keep this in mind the next time we’re there, that honey is calling out to me! Thank you Wendy. Many people pass it by without noticing and it is such a shame as this is such a cute, relaxing place. And the honey is just divine. Beautiful photos! I have always wanted to see cherry trees in full blossom, they look so stunning and peaceful. And the honey…oh how I love trying different kinds of fresh honey! Thank you Amy. 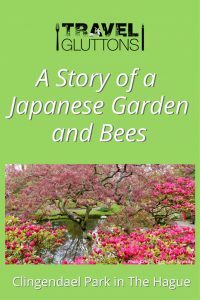 The Cherry trees are gorgeous and the honey so delicious. It’s always nice to learn about new places.It looks very special. Gorgeous pictures, informative story. Thanks for sharing! Thank you Anita. It’s a very unique and special place in the Netherlands. and so beautiful. How did you like it Jana? Make sure you stop if you go to the Clingendael Estate. Christine, do u like flavored honey? I often see flavors like orange blossom, lemon, etc., but usually just stick with pure honey. Hi Brian, I prefer pure honey and the different tastes that come with the pollen itself. My all-time favorite is from the plant heather but it is not easy to find. It has a beautiful off white color and a very flowery taste. And you? Lovely post! This garden sounds just wonderful! We have heavenly honey here in Cambodia, and when we lived in Abu Dhabi and Dubai we used to get the most aromatic honey from Saudi Arabia of all places. Australia, my birthplace, where I just spent three weeks also has the most divine honey, fragrant of the native bushland, especially eucalyptus. I have a thing for honey. Thanks for the honey tip. I live in walking distance to clingendael and go at least once a week and have never noticed honey being sold. I still can’t figure out where this in the park but will definitely try and find it.